A tiny new moon has been discovered orbiting Pluto, scientists announced today (July 11). Researchers using NASA's Hubble Space Telescope found the moon, bringing the number of known Pluto satellites to five. The discovery comes almost exactly one year after Hubble spotted Pluto's fourth moon, a tiny body currently called P4. "Just announced: Pluto has some company -- We've discovered a 5th moon using the Hubble Space Telescope!" Alan Stern, of the Southwest Research Institute in Boulder, Colo., announced via the Twitter social networking website today. Stern is principal investigator of NASA's New Horizons spacecraft, which is scheduled to fly by the Pluto system in 2015. It will be the first mission ever to visit the dwarf planet. 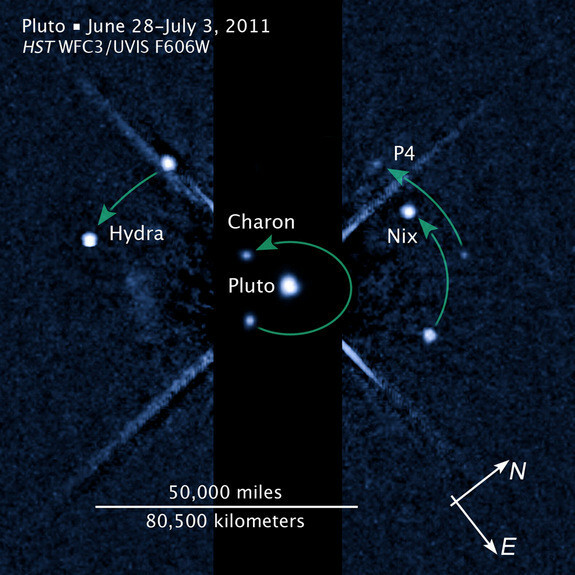 Pluto's other moons are Charon, Nix, Hydra and P4. Charon is by far the largest, measuring 648 miles (1,043 kilometers) across. Nix and Hydra range between 20 and 70 miles (32 to 113 km) wide, while P4 is thought to be 8 to 21 miles (13 to 34 km) across. The new moon looks a lot more like P4 than like Charon. "It's smaller than P4," Stern told SPACE.com. The new Pluto moon has been provisionally named S/2012 (134340) 1, though it's also going by the moniker P5. It was discovered using the Wide Field Camera 3 on the Hubble Space Telescope during a series of observations in late June and early July. P5 appears to be irregularly shaped, with a diameter between 6 and 15 miles (10 to 24 km). It zips around Pluto at an average distance of 29,000 miles (47,000 km), in an orbit thought to be coplanar with the dwarf planet's other satellites, researchers said. A team of astronomers using NASA's Hubble Space Telescope is reporting the discovery of another moon orbiting the icy dwarf planet Pluto. Image released July 11, 2012. "The moons form a series of neatly nested orbits, a bit like Russian dolls," said team lead Mark Showalter, of the SETI Institute in Mountain View, Calif., in a statement announcing the new moon. Charon was first spotted in 1978, 48 years after the discovery of Pluto. 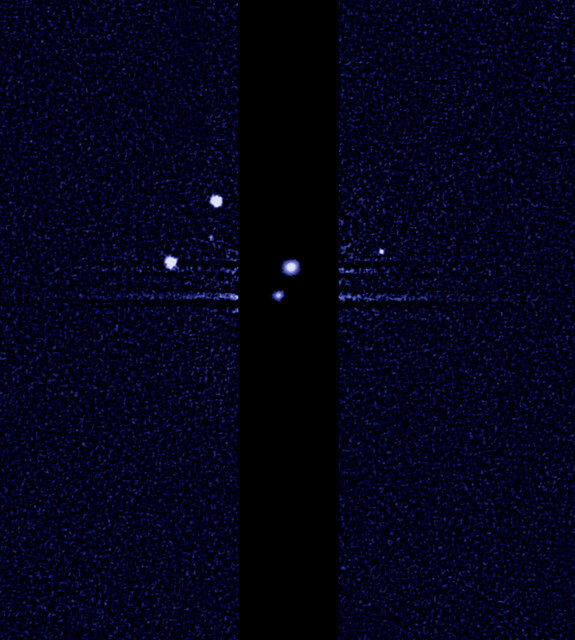 Nix and Hydra were found by Hubble in 2005. Pluto orbits 3.65 billion miles (5.87 billion km) from the sun on average, about 39 times farther away than Earth does. For more than 75 years after its discovery, the object was regarded as a full-fledged planet, but things changed in 2006. That year, the International Astronomical Union reclassified Pluto a dwarf planet, since it shares orbital space with lots of other objects out in the Kuiper Belt, the ring of icy bodies beyond Neptune. With another moon to account for around Pluto, NASA's New Horizons mission team is now taking a fresh look at the spacecraft's planned flyby in 2015 to make sure it will zip by the dwarf planet safely while observing the complex planetary system. "The discovery of so many small moons indirectly tells us that there must be lots of small particles lurking unseen in the Pluto system," said New Horizons team member Harold Weaver, of the Johns Hopkins University Applied Physics Laboratory in Laurel, Md. "The inventory of the Pluto system we're taking now with Hubble will help the New Horizons team design a safer trajectory for the spacecraft," Stern added in a statement. This story was updated at 11:51 a.m. ET with new details and comments.